Success stories from our customers speak volumes and are the best possible advertisements for our products. Here we present a selection of success stories which have been published in various media. If you have a success story with a WideTEK® or Bookeye® scanner product which you would like to share, please contact us and we will publish your story here. More than eight years in use, over 4.2 million scans and a very satisfied customer. Using two WideTEK® 36DS-300 large format duplex scanners, sold in 2010 by Image Access to Nielsen Media Research GmbH in Germany, they were able to scan millions of newspaper pages. 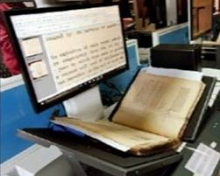 NEW DELHI: Over 50 lakh pages of archival records, which have been digitised over the past 16 months, will be made online within a month by Delhi government. The digitised records, which include a large number of government orders, rare photographs and manuscripts, will be available on the website of Delhi Archives that is likely to be launched by chief minister Arvind Kejriwal. While the access to the repository of historically important documents would be free, those interested in downloading the hi-resolution document would have to sign up and pay a fee. Image Access Partner Limeksofis has successfully integrated a total of 43 Bookeye® 4 V2 Professional scanners for the purpose of digitizing the document archive of the Land Registry and Cadaster of the Turkish Republic. In May 2015, the Hamburg Bucerius Law School replaced its entire inventory of book scanners with Bookeye® 4 overhead book scanners. Each of the three floors of its library now houses its own Bookeye 4, serving the law students around the clock, since this elite university law library is open 24/7. In the middle of regular daily operations, Germany´s second largest library successfully managed not only a technical, but also an organizational system upgrade in their scanning services infrastructure. The Bavarian State Library upgraded both the document delivery function in the back office and the self-service stations in the public reading rooms to the latest generation of book scanners. The development of a highly customized book scanner special model Bookeye® 4 V2 Professional, made by Image Access for the Municipal Archives of Lingen (Ems / Germany) - for operation by a visually impaired employee to digitize the archive?s collected materials. With over 100 years of history to be preserved in the Documentation and Information Centre of Sport Lisboa e Benfica, which brings together the best practices of conserving the large amount of documentation and the best document management technology to guarantee online access to information. Image Access spoke with Werner Claussnitzer, the president of XDOC, a company for business information technology and document management. Mr. Claussnitzer had an interesting story to tell about his work with the large format scanners from two vendors: the Magnum G600 from Contex and the WideTEK 48 from Image Access.